What To Do After P90X? I get a lot of questions about what to do after P90X. This is a very good question as it was one I asked myself. When I completed P90X I was so pumped with my P90X results I decided to go and do another round of it. After round two, P90X was starting to become a part of my lifestyle. When completing round two I went on and did one more round. Yup, three rounds of P90X. It was embedded into my brain that I was doing it as I had grown so accustomed to it. The one hour workouts did not bother me anymore and I looked forward to doing them. Remember how P90X is all about “muscle confusion”. And how Tony Horton talks about “variety” in P90X. Well, after the third round I no longer experienced muscle confusion and the workouts were no longer various. I really think it comes back to how in shape you were before starting P90X. I was in decent shape from all the running I did but had very little muscle. Around the middle of round three I noticed my reps and weights started to plateau. Basically, I could not get anything else out of P90X. I feel this is why people who are in phenomenal overall fitness tend to be maxing out right at the end of round one. People who are overweight or really out of shape can go for four or five consecutive rounds before maxing out. For me it was Insanity. And what a great change of pace it was. A much crazier pace of course but one that was needed. From there I went onto a P90X – Insanity hybrid workout that I created. Kind of missed all the pull ups you do in P90X and noticed I lost some strength. This gave another 90 days of working out. P90X Plus and the Insanity Deluxe workouts were next followed by the Tony Horton 1 on 1 series (now called P90X One on One). Lets step back to why you wanted to do P90X in the first place. Was it to lose weight? Get in shape? Train for your upcoming sports season? Whatever your “it” was you now need to go out and do it. Steve Edwards, who is a fitness/health guru employed by Beachbody, says that it is time to take a break and live a little. Your body should be in such great shape now that you need to use it for the purpose intended. What Steve is saying is its time to go out for a hike, mountain bike, swim, walk, run, and any other physical thing you like to do besides working out. For me it was getting in shape for skiing, playing softball, and golf. 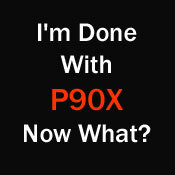 Between the seasons I would fit P90X into my everyday schedule. Then when my season came around I scaled back on P90X and focused on my skills for the game at hand. I was in such great shape at the start of the season that it would carry me through to the end of it working out half as much as I usually did to maintain the results I had. It was not like I was being inactive because the practices, games, and trips kept my body moving. When the season was done it was time to get back to P90X full time. With a Beachbody On Demand membership you’ll always have something to do after P90X. If getting crazy with Insanity is not your thing then start lifting with Body Beast. Regardless of what you choose there is always a new workout to do. I hope you can see that there are a lot of workouts and options for you after P90X. The key is to not stop moving. What’s helped me stay focused is signing up to be a Beachbody Coach. They alert me when new workouts come out and ways to modify programs. Its been a big help in staying committed to fitness and taking the next steps after P90X.